In 1939, the RLM started the 'Bomber-B' competition to find a replacement for the He-111 and Ju88. Requirements were a 4,000kg load to any point in the British Isles and the aircraft would use a new Junkers or Daimler Benz engine that was under development. Four firms were issued contracts; Arado, Dornier, Junkers, and Focke-Wulf. This resulted in three actually making it to prototype stage with the Ju-288, FW-191 and Dornier Do-317. The Ju-288 was the most developed of the three. Arado's entry was probably one of the more unusual designs with a twin boom layout to provide un-restricted rear view for the rear guns. It was also the one that the RLM decided not to proceed with. The other entrants, despite good flying characteristics were all hampered by the lack of the promised engines and some rather forward-thinking design situations that were also plagued by bugs. This one is totally up to the usual standards for Anigrand. The overall molding is quite good with somewhat large engraved panel lines. There are the usual air bubbles on the tips of wings and such; easy enough to fix in a few minutes. You will also find resin pour stubs to remove and some flash, again, standard fare. As is the norm, I didn't open up the sections of the bag that contain the smaller bits, but found them to be as expected. One thing that did catch my eye was that there are nine prop blades and two three bladed spinners. The instructions show three bladed props while the drawing that is included show four bladed props. Since all the other bombers in the Bomber B program have four blade props, I'm thinking this one should as well, so it is up to you if you want to fill and redrill the spinners. You have the blades to do it. 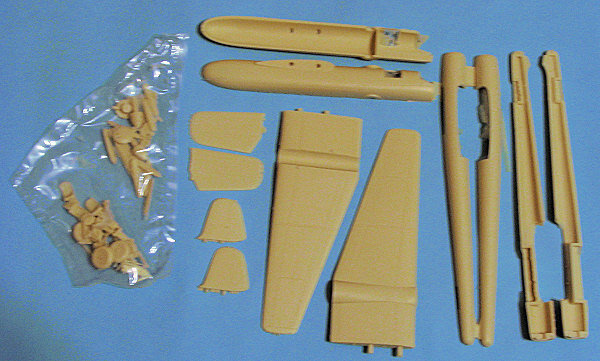 The kit also includes one canopy set and thanks to the lack of small frames, this one should be quite easy to mask. I also noticed that the fairings for the remote turret controls look very much like those provided in the XB-28 kit. I also noticed that the turret mounting holes were well centered on this one. Since this one is a tail sitter, no need to sweat nose weight. Instructions are the usual fare with a single exploded view (showing the gear doors in the closed position). 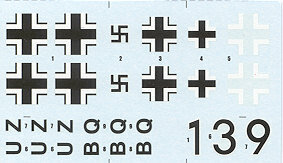 Markings are for one plane in overall RLM 65 with RLM 70 mottling over the entire upper surface. Decals are nicely done and one only uses the insignia, leading me to think that this sheet was originally done for another kit or one coming up. Another superb kit of an interesting subject. For those who are interested, you can now model all four of the 'Bomber B' aircraft in 1/72. 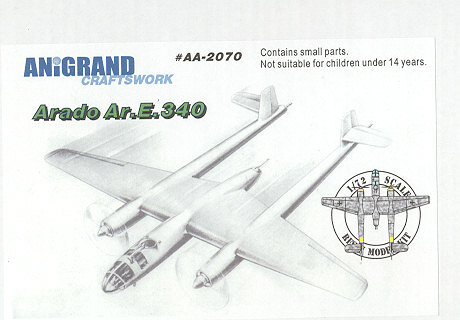 Huma does the Ju-288, Planet Models does the FW-191, and Special Hobby produced the Do-317. My thanks to Anigrand USA for the review kit. Get yours from the hyperlink and pay no shipping in the US.